It may not be easy, but we can lessen our impact on the environment if we apply the three R’s to pysankarstvo. We should reduce consumption, reuse what has been consumed and, when it cannot be reused any further, recycle it. Remember, recycling the the third best option, not the first! And, of course, chucking things into the trash is the last...and worst. There are many things we can do to lessen our impact. I’ve listed a few below. Buy locally if possible – this decreases fossil fuel consumption needed for transport, and, if your farmer is green, healthier chickens with fewer chemicals in them and their eggs, and less antibiotic resistance. Reuse styrofoam cartons if you can’t get cardboard. I use styrofoam for storing finished pysanky (emptied and fully dry), and have found that local egg producers are happy to have my old cartons. Compost bad eggs–rather than throwing them in the trash, I put my bad eggs (cracks discovered too late, oozing through shell, mistakes in waxing) either into my composter, or out in my garden, where the raccoons and skunks can have a feast. My eggs are sometimes pretty old by the time I get around to using them, so eating my mistakes may not be an option. I would not suggest leaving eggs out if you live in an area with rats, though. Reuse egg drying paper towels. I use Viva towels, which are sturdy, and get many, many uses from each one by using a three basket solution. I have three identical tall wastebaskets next to my dyeing table. The first two are for dry towels: one for yellows and reads, and the other for blues, greens and dark colors. The third is for damp or recently used towels. To dry a pysanka, I grab a towel of the appropriate color from one of the first two baskets. After I’ve dried it, I drop the damp towel into the third basket. Every few weeks or so, I sort the (now dried) towels into third basket and put them back in the first two. Repurpose work space towels. I use a pile of paper towels as my work surface. The towels cushion the egg, but also pick up pencil marks and wax from the egg, and drips of wax from the stylus. Then I turn each sheet 90º four times, and then turn it over and repeat this again. Once the sheet has become too dirty to work on, I either fold it into quarters and use it for wax removal, or cut it up into small triangles and use for wicking the eggs after draining them. It’s not always necessary to buy your candles, and your stubs can be further repurposed. Candles are of two types–paraffin (a petroleum product) and beeswax (made by bees). Until recently, beeswax candles were significantly more expensive but, as the price of oil has gone up, so has the price of paraffin. If buying new candles, compare prices, and, if possible, go with the more sustainable solution, beeswax. Also, consider the fact that beeswax candles burn more slowly, and produce less soot. Garage sales. You can often find old, dusty, ugly tapers at garage sales. Buy them and use them. I often cut or break them in half to get the right size. Church. If you belong to one of the more traditional churches that still burn candles, ask around and find out what they do with the stubs. The candle man at my church saves them for me in a box, which I take home and reuse. 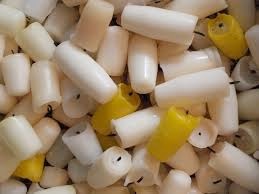 In my case, these candle stubs are beeswax, and can be melted down and used for writing wax. Paraffin stubs. 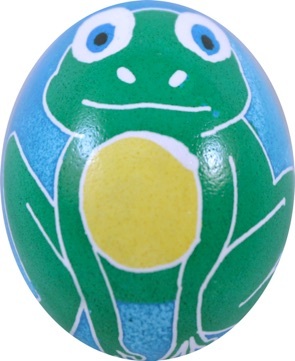 A stub several inches long can be used for making pysanky. When they get very short, I pry them out of the candle holder and toss them in a box. The really small stubs can be used as fire-starters either in a fireplace, a fire pit, a chiminea or for campfires at the cottage. Beeswax stubs: Melt them down, fish or strain out the wicks, and pour into silicone forms to make your own beeswax cakes. If you use cakes of beeswax, you end up with small, oddly shaped bits after a while. Save them, and when you have a bunch, melt them down and pour into a form (I like silicone chocolate molds) to make your own cakes of wax. Used wax like this is naturally darkened, a bonus! Aniline dyes are fairly inexpensive, but they are produced in an industrial process which results in toxic by-products. The dilute concentrations we use are not toxic in and of themselves, but getting more use out of our dyes saves money and may decrease environmental pollution a tiny bit. Dyes which have not been used in a while may benefit for a shot of vinegar. Before tossing out an old dye, try reinvigorating it with a bit of acidification. Molds happen. They are in the air, floating around, just looking for a new home. And they find the aniline milieu a pleasant and fruitful one. Keep your dyes closed when not in use, rinse off spoons between jars of dye, and strain and boil dyes which develop a little bit of mold. When mixing new dyes, try adding the dye powder to an old, weak (but otherwise clean) dye. Heat it first, of course, so the dye powder will dissolve. This results in more dye being in solution, and your dye should last longer. Experiment with natural dyes. Onion skins will give you a lovely deep red color, other plant materials will give you yellow, gold, green and brown shades. While you can buy fancy containers to package your pysanky, and all sorts of mailers to ship them, there are other approaches you can take. Resale shops. These are a great place to find interesting containers to package your pysanky in for gift giving. They usually have lots of decorative tins to choose from, along with baskets, boxes and the like. Not only will you be re-using, you’ll also save money! Household waste. 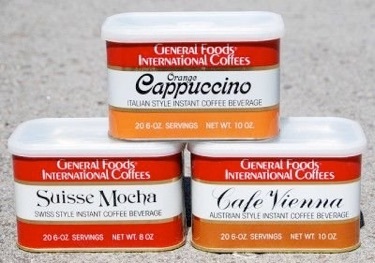 You can re-use various tins and boxes you find around the house. Sometimes all they need is some pretty wrapping paper to make them into lovely gift boxes. I use tins (which are now, sadly, plastic) from General Foods International Coffees to package my pysanky. They are just the right size for one large chicken egg and a good bit of protective paper. My cousin saves her tins for me. Amazon (and other shipping) boxes. Unless you are an outlier, you probably have a bunch of these around. Re-use them if you want to ship, including the bubble wrap and packing peanuts that were included. No need to buy new. Junk mail and newspapers. These are great for packing items in boxes for shipping, if you have no bubble wrap or packing peanuts to recycle. Wad them up, and fill any open spaces with them. While you can buy lots of new items for your pysanka studio, you can also reuse old household items. Plates, bowls and jar lids. These can be repurposed into candle holders. A wide base is important. 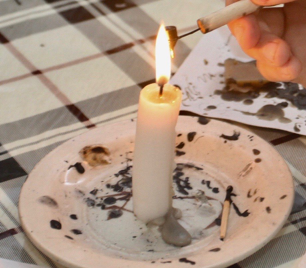 Just drip some hot wax onto a flat surface, and set the candle down. Instant candle holder! Back to Main Pysankarstvo page. Back to MAIN Pysanka home page.